For much of the year, the duPont-Ball Library at Stetson University stays open from 8 a.m. to 2 a.m. to provide students with a quiet place to study. The duPont-Ball Library on Stetson’s DeLand campus will soon be retrofitted with energy-efficient LED lighting. That makes the library an ideal candidate for retrofitting, replacing fluorescent bulbs with more energy-efficient LED lighting. 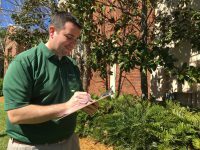 Stetson is surveying its buildings this summer as part of a campus-wide effort to switch to LED lighting. 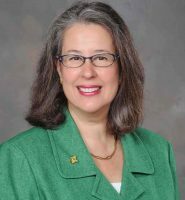 Stetson President Wendy B. Libby, Ph.D., said the Board of Trustees recently approved $1.5 million in the upcoming budget for energy-saving projects, including the retrofitting. “These energy projects will have a payback of four years, so after four years we will be more than recouping our investment,” Libby said at a staff meeting last month. The projects are part of the American College & University Presidents Climate Commitment. Former Stetson President Doug Lee became a Charter Signatory in June 2007, pledging the university would strive to become carbon neutral by 2050. The efforts already are paying off. The university increased student enrollment and added more buildings in recent years, but reduced its energy usage and water consumption by 11.3 percent from 2014 to 2016. The Marshall & Vera Lea Rinker Welcome Center was designed with environmental conservation in mind and earned Green Globes Certification for a number of design features, including energy and water efficiency. New buildings, such as the Marshall & Vera Lea Rinker Welcome Center, were designed with energy-efficiency in mind. The Welcome Center uses solar-powered LED lighting in the parking areas and LED lighting throughout. The light-emitting diode (LED) requires less energy, lasts longer than other bulbs and produces far less heat, which means less electricity for air-conditioning, too. “Lighting can be up to a third of your electrical use,” explained Cloudman, who works for Cenergistic, a company that specializes in energy conservation and works under contract for Stetson. “The prices for LED lighting have been coming down significantly. “I’ve been changing all the bulbs in my home to LED. … I’ve definitely seen a reduction in our power bill,” he said, adding he also installed occupancy sensors in some rooms that automatically turn out lights when there’s no movement for a short period of time. Stetson is installing some occupancy sensors, as well. And the university has been switching to LED lighting throughout the campus, such as during renovation projects and when bulbs burn out. Some decorative light poles on campus now use LED lighting and the lights at the main university entrance off Woodland Boulevard switched to LED a year ago. “They’re actually brighter now than they were before,” Cloudman said. An investment in Davis Hall results in a nearly 50 percent decline in energy use. Stetson increased student enrollment and added buildings in recent years, but reduced energy usage and water consumption by 11.3 percent. Here’s how.